Video: What is Sacred Birthing? "Birth is the essence of evolution. 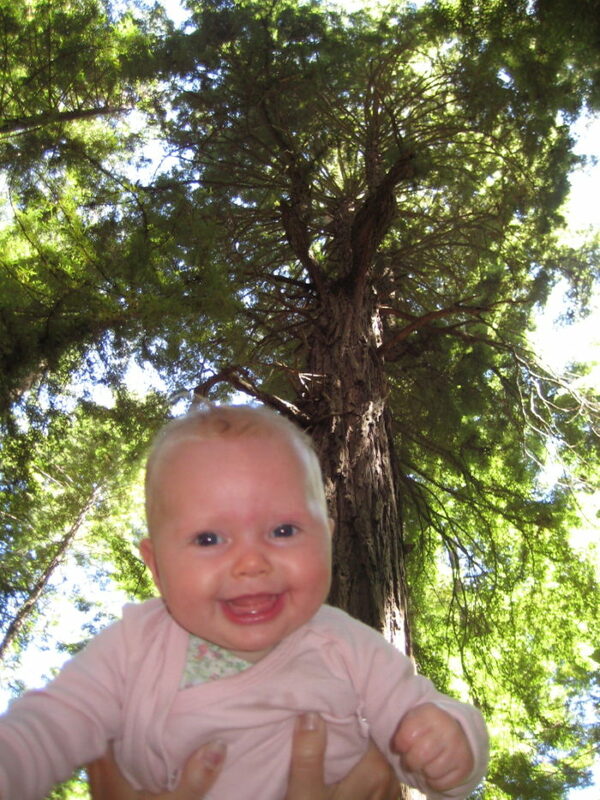 The gift of a sacred birth fosters peace in our babies, our self, our community and our sacred planet." BE Happy! No Worries about my Cord! There is much talk about the dangers of the cord being wrapped around the baby’s neck. Everyone in the checkout line has a story about the cord around their baby’s neck. This is one of the most common worries in pregnancy, and adds drama and fear to birth where none needs to exist. The truth is, many babies are born with the cord around their neck. Maybe even most babies. This happens because when the baby is a tiny ‘little bean’ he jumps all around as if he’s on a trampoline, and can jump right through a loop of his own cord. Then as he grows, there is little chance of getting back through that loop. I have found that certain kinds of exercise, like diving, and doing intense aerobic exercise, or flip turns when swimming laps in a pool, can cause the baby to be tangled up in his cord, and because of that, can increase the time of labor. This is not a problem if you have a home birth, but taking “too long” is one of those things that’s most likely ‘managed’ in the hospital. So enjoy swimming but don’t do somersaults. Exercise for breathing and feeling alive! In my experience, umbilical cords are often around the baby’s neck. Sometimes they have even been tightly wrapped around the baby’s neck as much as three times, and a baby is still fine. Here is a picture of a placenta and its normal umbilical cord. 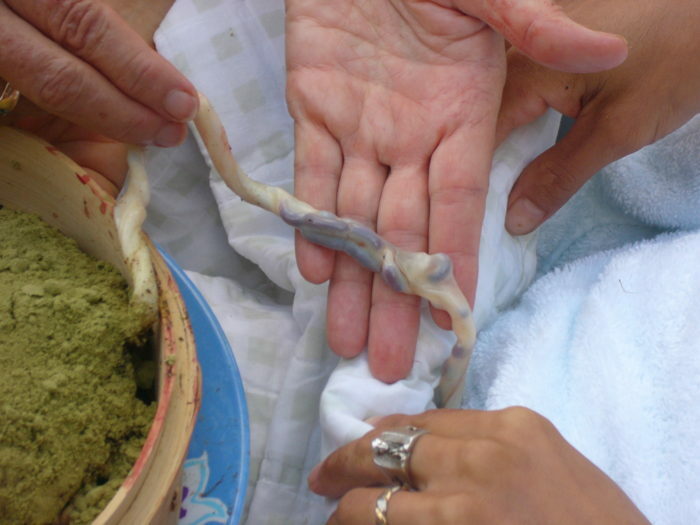 The placenta has been prepared as a Lotus birth with Rosemary powder, and that’s why it is green. It sits in a steaming basket on a plate. Cords typically have blood clots left in them that create dark bumps. Often these bumps are assumed to be knots in the cord because they make it fat in places. Untrue. It’s just the leftover blood, going from baby to mother, that remains in the cord. So, Be happy. Let go of all worries about the cord being around baby’s neck. Even if it is, it’s OK.
Posted on September 8, 2017 September 15, 2017 Author Sunni KarlllCategories Birth Story, In Pictures, Lotus BirthTags cord around baby’s neck, cord problems, flip turns swimming laps and pregnancy, increase labor time, knots in the cord, placenta, rosemary, umbilical cordLeave a comment on BE Happy! No Worries about my Cord!